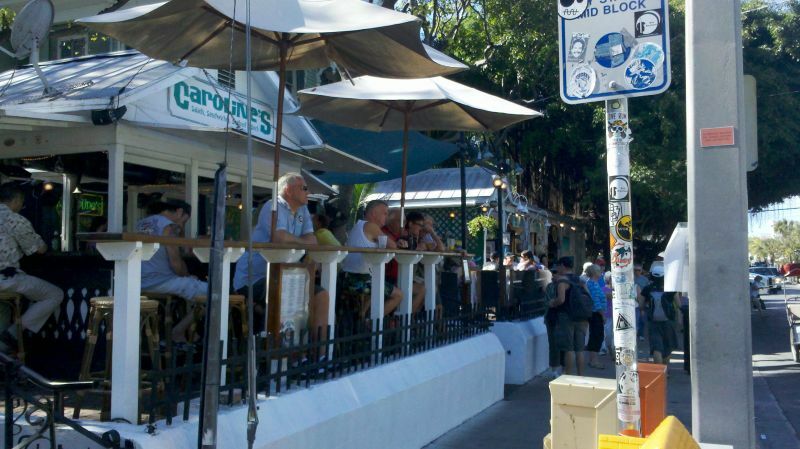 My friend Pat Harris, upon learning that I would be a swinging bachelor in Key West for a week, strongly suggested that I go down to Duval Street and check out the action during the first big week of Spring Break, starting with President’s Day. So I dutifully got on my bike and headed toward chaos. 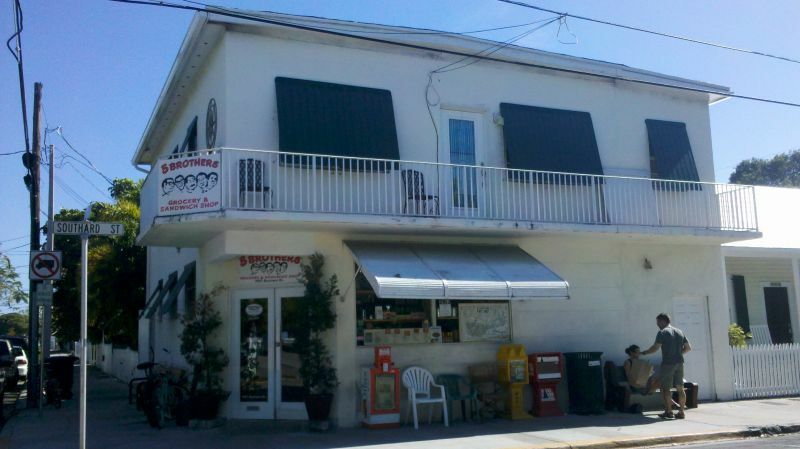 But I stopped first to fortify myself with a Cuban Sandwich and cafe con leche at 5 Brothers Grocery, home of the best Cuban in Key West. It was fantastic. But how can a Cuban sandwich in Key West be all that much different from a Cuban at a New York deli, since by definition a Cuban has the same ingredients — roast port, ham, yellow mustard and dill pickles, all pressed to mold everything together on a grill? I think the secret is the bread. Cuban bread is slightly sweet and very soft — so you get the classic Chinese taste combination — salt, sweet, hot, sour. And since on Memsahib we consider pickles a vegetable, it is a well-balanced meal. But I digress. Duval was crowded as usual and I fired up the camera in anticipation of the crazy pictures I would send back to Pat — probably too racy for this family-friendly blog. Only to find that the average age of the wild female Spring Breakers was something between 71 and 76, the range depending on whether you count those with walkers as active players or on the DL. There was not a co-ed in sight, and I walked for three blocks. Obviously, school might be out, but the cruise ships were IN. Then I had a frightening thought. Some of my co-generationists were hitting the sauce pretty hard. What if some crazy old coot yelled, “Show Me Your ***s!” And what if some crazy old cootess DID! I ducked into Sloppy Joes Bar to steady up. 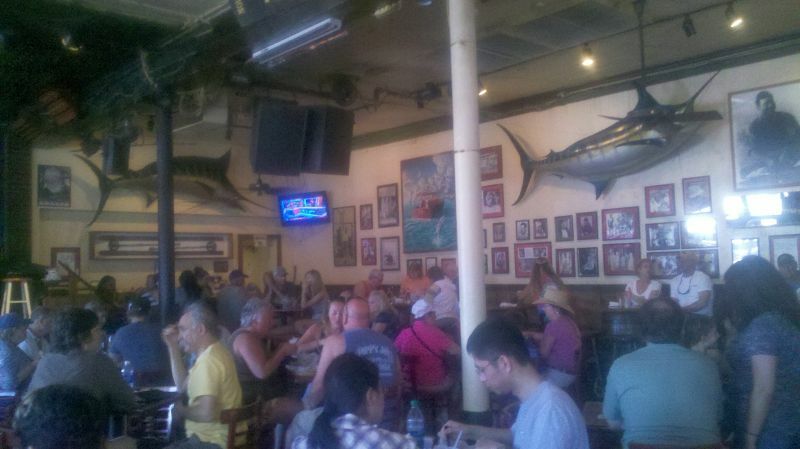 Sloppy Joes was Hemingway’s favorite bar, and it is dedicated to his fishing and drinking exploits. 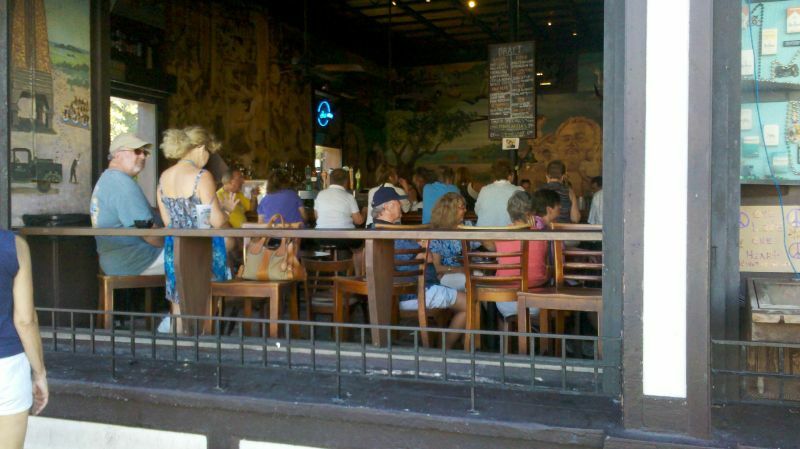 I really wanted — and needed — a Papa Doble, Hemingway’s favorite drink. I was disappointed to find out that even at Sloppy Joes, a great drink that is basically a lot of rum amd a little lime and grapefruit juice, has been tarted up with soda, sugar and maraschino cherries, and for all I know, an umbrella. So in honor of another great writer, ranconteur, sportsman, and man-among-men, I had a double Mount Gay and tonic, the Ray Gaulke Doble. Spring Breakers DRINKING ALCOHOL at 3 in the afternoon! 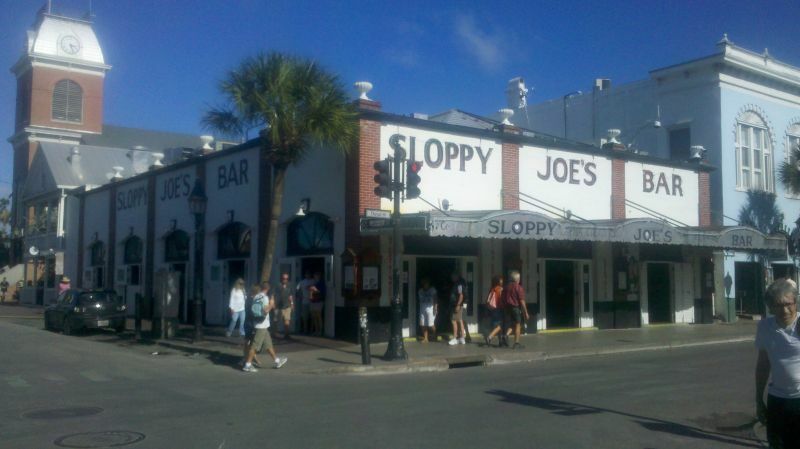 Sloppy Joes — touristy, but how is anyone who has read every word Ernest Hemingway ever wrote going to stay away. Never heard of the “Ray Gaulke Doble” but its now my favorite. Thanks Paul. Never too old for a happy childhood on Duval Street! !